In the map on the infographic, color indicates which team is most popular on Facebook within each state. And as you can see by the majority of red, America is a Patriots nation. West coast states, naturally, have a larger portion of their population cheering for the 49ers (gold) this weekend. New York, Pennsylvania and New Jersey are cheering for the Giants (blue), while the majority in Delaware and Maryland are cheering for the Ravens (purple). We pitted the teams against one another in terms of the total number of people interested in each team on Facebook across the United States. If Facebook reach determined the winners this Sunday, The Patriots and Giants would take home wins. 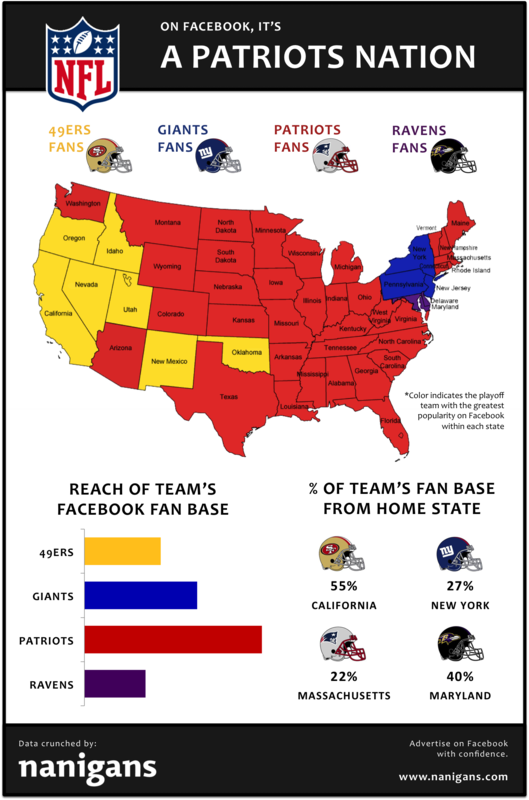 The Patriots have more than three times the number of fans on Facebook than the Ravens, and the Giants have a third more fans than the 49ers. Also underscoring how America is a Patriots nation, 88% of Patriots fans live outside their home stadium state of Massachusetts. The Giants follow closely behind with 73% of its fan base outside of New York. The 49ers and Ravens, on the other hand, have the greatest portion of their fans in their home state, at 55% and 40%, respectively. Who are you cheering for this weekend? Are the majority of people in your state cheering the same? Let us know in the comments!